This chapter looks at a subclass of VGLMs called Reduced-Rank VGLMs (RR-VGLMs). They are built on the idea of latent variables, and are the same as VGLMs except some of their constraint matrices are estimated. RR-VGLMs have with interesting properties and applications. It is a dimension-reduction method, e.g., when applied to the multinomial logit model it leads to the stereotype model. 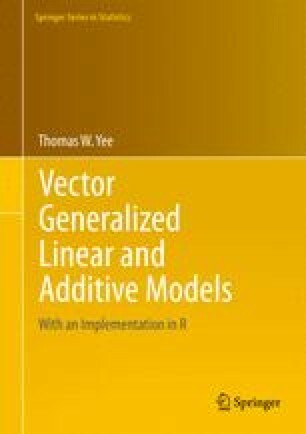 Another related class of models is row–column interaction models (RCIMs), and two-parameter RR-VGLMs are described in this chapter. Some applications mentioned here and/or developed elsewhere include quasi-variances and indirect gradient analysis.